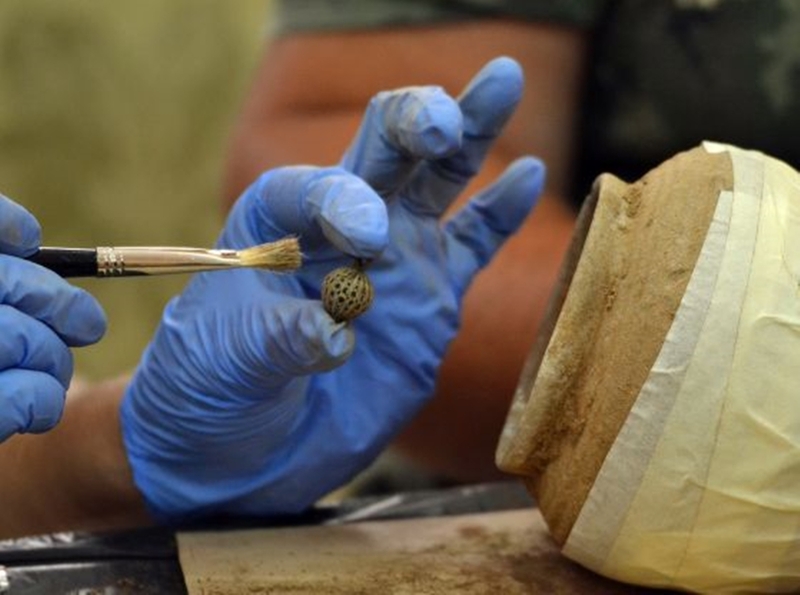 An archaeological team working at the site of the Kaliakra Fortress on Bulgaria’s northern Black Sea coast have found a small clay pot containing close to 1000 objects, including silver and gold coins and jewellery, the National History Museum announced. The find was made on August 17 2018. The items in the clay pot included 873 silver and 28 gold coins, 11 appliqués and buckles, 28 silver and bronze buttons, 11 gold earrings, two rings, one of them gold, and four beads made of precious stones and gold. The discovery, beneath the floor of a room that was burnt in the 14th century, happened during the 15th year of excavations at the fortress. The archaeological investigations are funded by the Ministry of Culture, Kavarna municipality and the National History Museum. The team is headed by the director of the National History Museum, Associate Professor Bonnie Petrunova. An initial examination of a small part of the coins established that not only are there silver Ottoman coins, but also many Bulgarian ones. The Ottoman coins make up about 60 per cent. Basically, they are from the time of Sultan Bayazid Yildirum (1389-1402), and a small part from that of his predecessor, Murad I (1362-1389). All the jewels were concealed at the end of the 14th century during one of the dramatic attacks on the capital of the Despotate of Dobruja, the National History Museum’s statement said . One of these events is described in one of the chronicles of this time, which notes that in 1399 the Tatars of the Aktav horde invaded Varna and other towns along the Northern Black Sea coast. In 1401, the Tatars of Aktav, who was known as the Dobrudzha Tatar, were defeated and displaced in various villages such as Provadia, Rusokastro and others. It is possible that one of their commanders has gathered the treasure discovered at Kaliakra. It appears that he had seized them from different people and places and hid them under the floor of his house shortly before it was burnt. In the same building, during the 2014-2017 surveys, part of a silver church bookcase, a white jade belt buckle, and 26 small copper coins from the time Bayezid I Yilderham (1389-1402) ), were found. The building itself was built directly on the ruins of ancient buildings. Burial sites were found nearby. 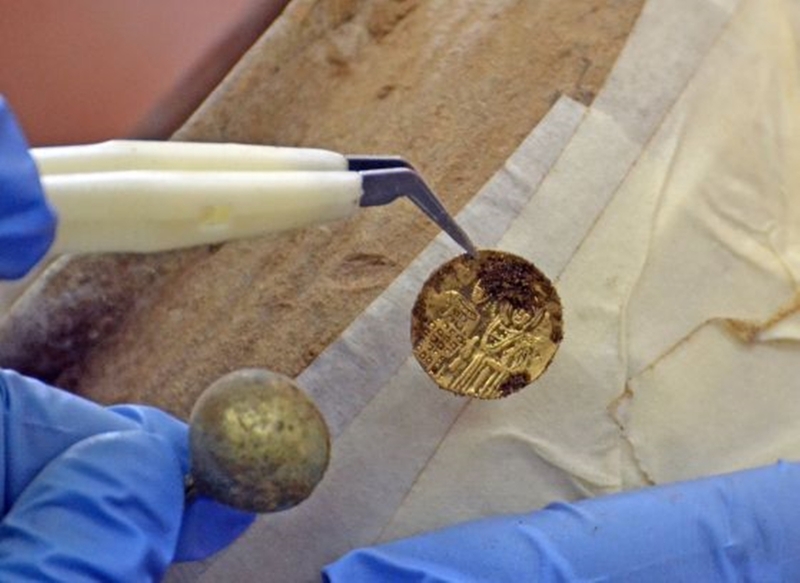 In one of the graves, in 2014, three gold coins, dating from the Nicene dynasty in the 13th century were found. This is the third treasure to be found at the site, following two finds in earlier years, one of 60 coins, and another of 80 coins, gold earrings and small ornaments.